es include the [[Catskill Scenic Trails in Stamford. Several ski centers provide downhill mountain bicycling in the warmer months. 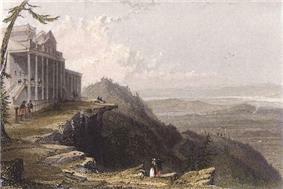 The Catskill Mountain House was a famous hotel near Palenville, New York, in the Catskill Mountains overlooking the Hudson River Valley built in 1824. In its prime to the turn of the century, it was visited by United States Presidents Ulysses S. Grant, Chester A. Arthur, and Theodore Roosevelt, as well as many other important personages. 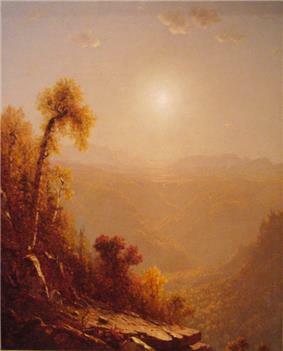 Shortly after it was completed, the Mountain House became a favorite subject for Washington Irving and artists for the new Hudson River School, most notably artists Thomas Cole and William Henry Bartlett. 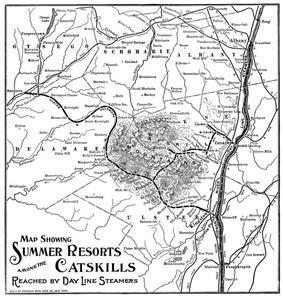 From 1872, the Catskills were served by the Catskill Mountain Branch of the Ulster and Delaware Railroad which was absorbed into the New York Central railroad in 1932. Passenger rail service continued until 1954. Part of the line still exists but now serves only freight. The Delaware and Ulster Railroad is a heritage railroad, based in Arkville, New York, that still runs a scenic part of the track from Highmount to Hubbell Corners, New York for tourist use. The Catskill Mountain Railroad is also a heritage railroad in the Catskills, operating from Kingston, New York up to Highmount, New York. The Catskills are accessible by automobile from the east along Interstate 87/New York State Thruway, which runs north-south through the Hudson Valley. To the south and southwest, the Catskills are accessible by a variety of highways, including New York State Route 55, U.S. Route 44, U.S. Route 209, and New York State Route 17 (also known as "Future I-86"). Access to the western Catskills is provided by New York State Route 30; and the vaguely defined far-western edge of the region is variously considered to be New York State Route 10 or Interstate 88, though this boundary remains a matter of local preference. New York State Routes 28 and 23A cut east-west through the heart of the Catskills, serving many of the most popular outdoor tourist destinations. New York State Route 23 runs east-west across the Catskills' far-northern section. 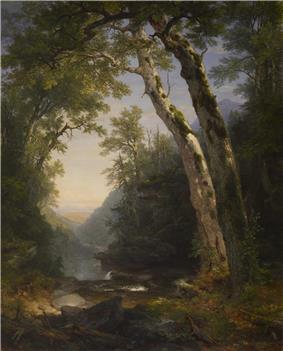 Painting by Asher Brown Durand depicting the Catskills using the "sublime landscape" approach. The Walters Art Museum. Casper Meets Wendy (1995) Wendy and her aunts run into Casper and his uncles at a resort in the Catskills. The Catskill Chainsaw Redemption (2004) A horror movie. The Gig (1985) Director: Frank D. Gilroy, character study, amateur musicians get a gig. Having Wonderful Time (1938) Red Skelton's first movie, set in a Catskills hotel. Heavy (1995) An independent film starring Liv Tyler, Debbie Harry, Pruitt Taylor Vince, Shelley Winters, and Joe Grifasi was filmed partially in the southern Catskills in Barryville and Highland Lake. Magic, the 1978 film starring Anthony Hopkins is set in the Catskills. Martha Marcy May Marlene (2011) Critically acclaimed film about a young woman who escapes from a cult in the Catskills. My Side of the Mountain A young boy tests his survival skills by living about 2 years in the Catskill Mountains. Stake Land (2010), a vampire/zombie apocalypse film, partially set and filmed in the Catskills. Sweet Lorraine (1987) story of an aging Catskill resort in its last days, filmed at the former Heiden Hotel in South Fallsburg. Taking Woodstock (2009) – The story of how Elliot Tiber helped bring the Woodstock Festival to Bethel, New York. Tootsie (1982) – Features scenes in the "Hurley Mountain Inn" located in Ulster County. Parts of the movie Transamerica (2005) starring Felicity Huffman were filmed in Callicoon though in the movie it's referred to as Callicoon, Kentucky. A Walk on the Moon (1999) Set in Sullivan County, but filmed in Quebec, Canada. Wendigo (2001) Filmed in West Shokan and Phoenicia area. Woodstock, a 1970 documentary about the Woodstock Festival of 1969, was filmed at the festival in Bethel. You Can Count on Me (2000) Award-winning independent film set in the village of Scottsville, in western New York near Rochester, but filmed in the Catskills, in and around Margaretville and Phoenicia. New York State Office of Parks, Recreation and Historic Preservation. (2013). Catskill. Washington Irving wrote many famous stories including Rip Van Winkle that take place in the Catskill Mountains. The Catskills are famous in American cultural history for being the site of stand up comedy. Comedians such as Don Rickles and Rodney Dangerfield got their start performing in Catskill Hotel venues. The Catskills and their inhabitants play an important role in the stories The Lurking Fear" and "Beyond the Wall of Sleep" by H. P. Lovecraft. The town of Bethel, New York, located in the Catskills was home to the famous Woodstock Music festival in 1969. The music festival took place from August 15 to August 18, 1969. 32 music acts performed in front of over 500,000 concert-goers. The event was captured in the 1970 documentary movie Woodstock. The 1973 novel Nickel Mountain: A Pastoral Novel by John Gardner takes place in the Catskill Mountains. 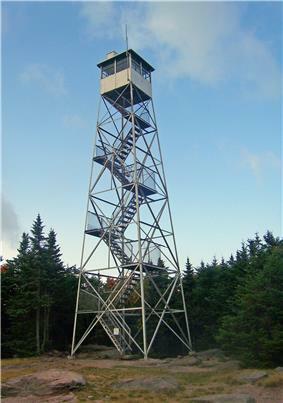 The Catskills are mentioned in The Band's song "Time to Kill." The Band was also photographed there for their first album, Music from Big Pink The Band in the Catskills. Mercury Rev's song "Opus 40" on their 1998 album Deserter's Songs contains the line "Catskill mansions buried dreams/ I'm alive she cried but I don't know what it means". The band and their studios are based in the Catskills, and the area is often referred to in interview. In Bill Willingham's comic book series Fables, the animals and other fairy tale characters live on "The Farm", an imaginary haven in the NY Catskills. A Home Box Office miniseries is planned that will dramatize a New York Magazine article on natural gas drillers coming to the region. Richard Russo, a winner of the Pulitzer Prize, is writing a script for the project. Simple Minds filmed their video to "Alive and Kicking" here. ^ a b c Schwartz, C. C., Miller, S. D. and Haroldson, M. A. (2003). "Grizzly bear". pp. 556–586 in G. A. Feldhamer, B. C. Thompson and J. A. Chapman, eds. Wild Mammals of North America: Biology, Management, and Conservation. Johns Hopkins University Press, Baltimore, MD. ^ Grizz: Of Men and the Great Bear. National Geographic Article, February 1986. Douglas H. Chadwick. ^ )Ursus arctos horribilisSpecies Profile: Grizzly bear (. U.S. Fish and Wildlife Service. Ecos.fws.gov. Retrieved 17 August 2012. ^ Hamilton, A. N. 2008 Grizzly Bear Population Estimate for British Columbia. Ministry of Environment, British Columbia. ^ Brown, Gary. The Great Bear Almanac. Guilford, CT, 1993, pg. 91.